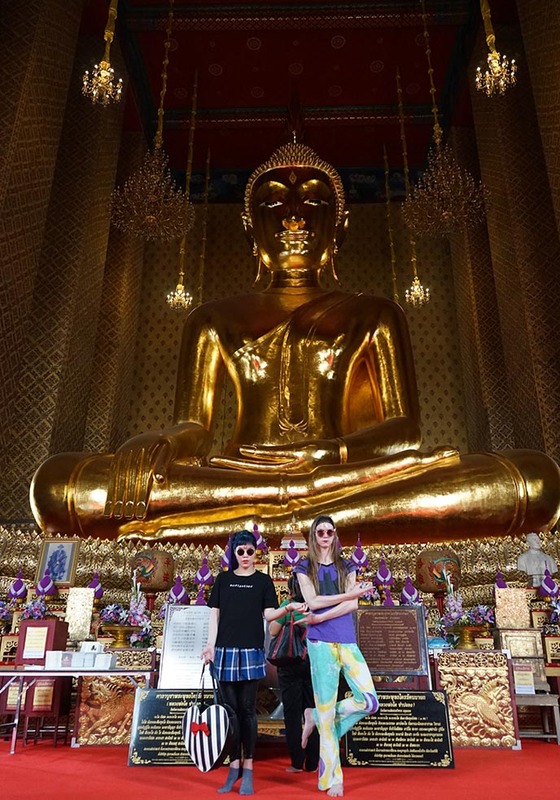 Let’s start this Thailand temple diary in a fitting way… with an Italo Disco song! And if you’re lucky then the god’s a she. 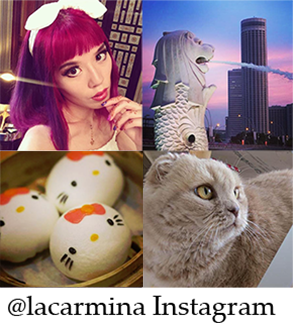 I can’t stand basic, big group tours — which is why I teamed up instead with Tours By Locals. 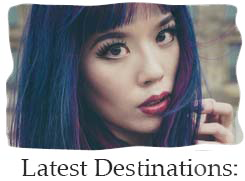 They link travellers with passionate local guides, and create a custom itinerary off the beaten track. 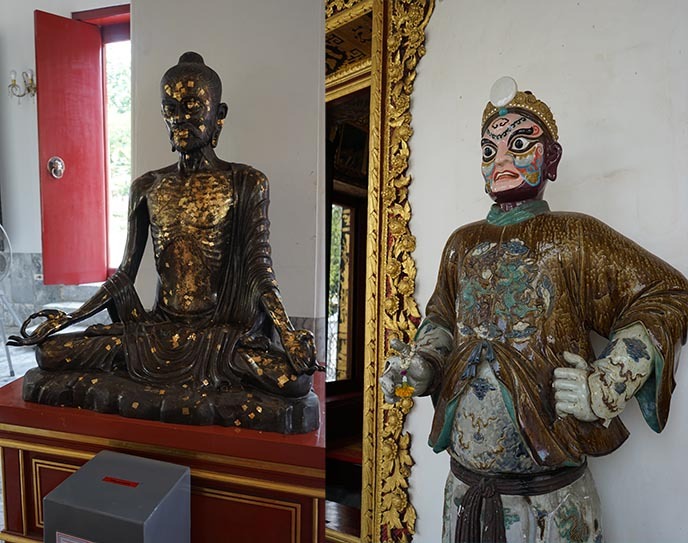 My friends and I were keen to see Thai Buddhist art and spirituality, without crowds elbowing us. Our guide Kay listened to our preferences, and delivered by taking us to obscure temples (like Wat Kalayanamit) that were literally empty of tourists. As you’ll see, the day tour was a joy, and left us buzzing with knowledge and inspiration. 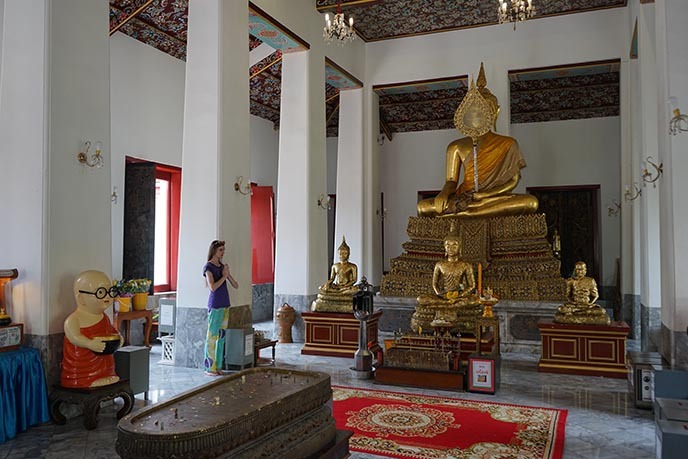 Kay picked us up and gave us an overview of Thai Buddhist culture, along with a primer on helpful phrases. Becky Hawkins made this terrific reaction drawing of her and her “shoulder angel”! 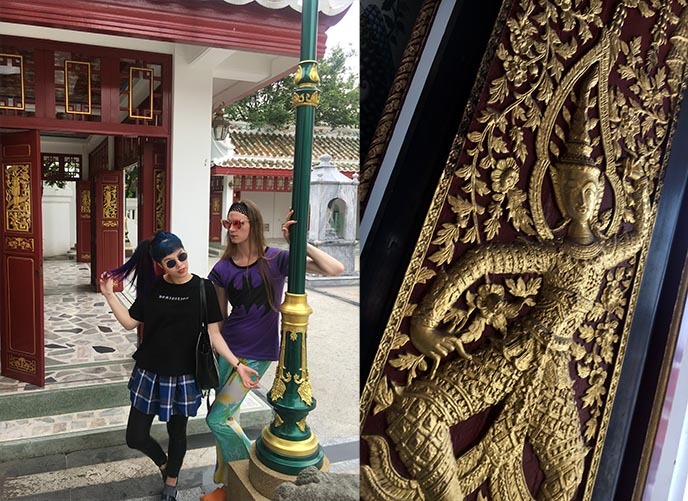 I have been to Thailand twice before, but it’s always a joy to return (and this was the first visit for Yukiro, Naomi, and Becky). 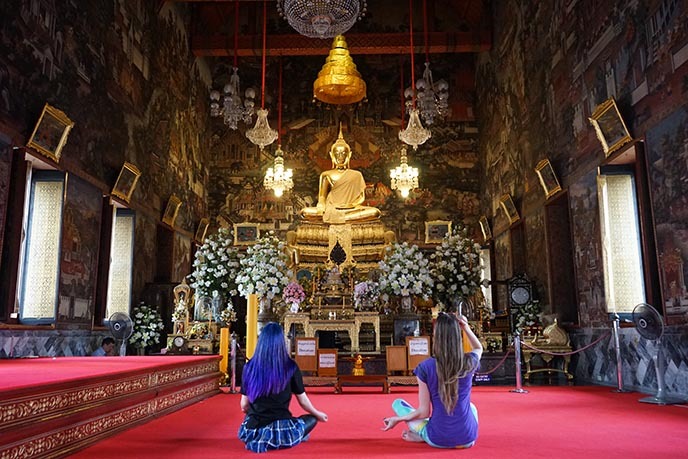 Even though Bangkok is now an extremely popular destination, you can still enjoy the warm, welcoming Buddhist culture. 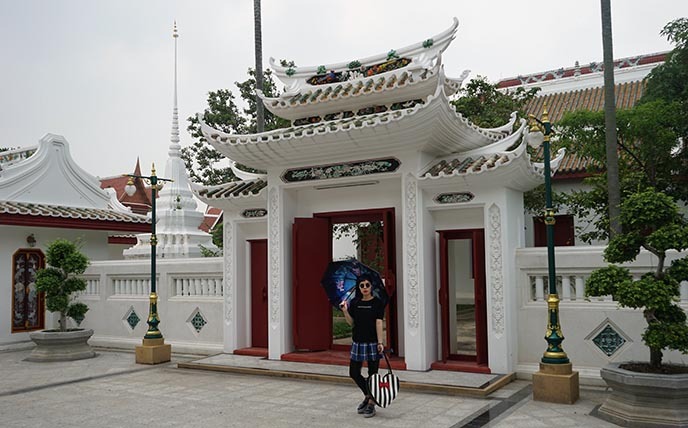 So many temples, so little time… There are over 400 “wats” in Bangkok alone. 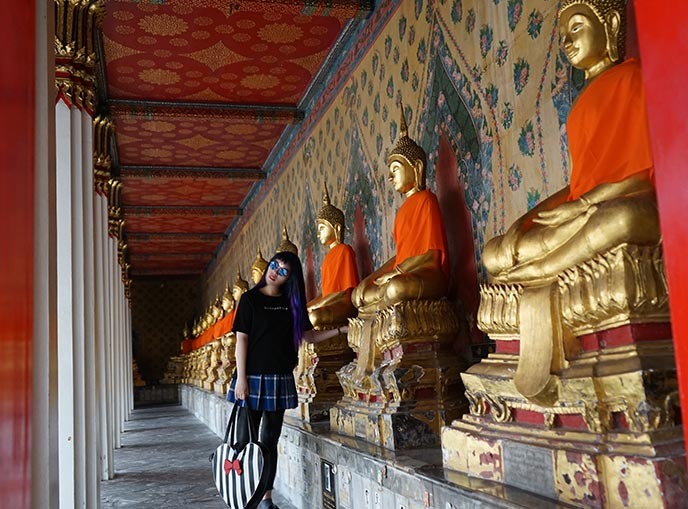 The most famous ones (Wat Pra Kaew, Wat Arun, Wat Pho) are certainly worth seeing if you’re here for the first time. 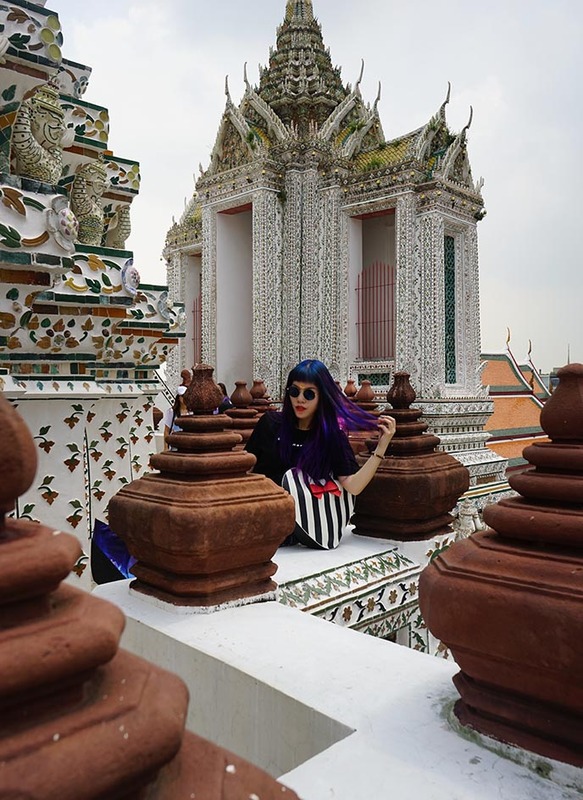 Kay made sure we got to peek around Wat Arun, but focused most of our tour on temples where tourists rarely tread. 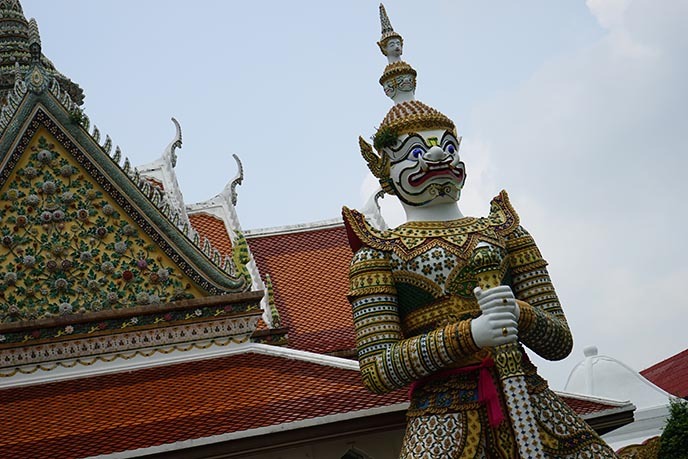 We also said hello to the giant demon yaksha, guarding the Grand Palace at Wat Phra Kaew (Temple of the Emerald Buddha). 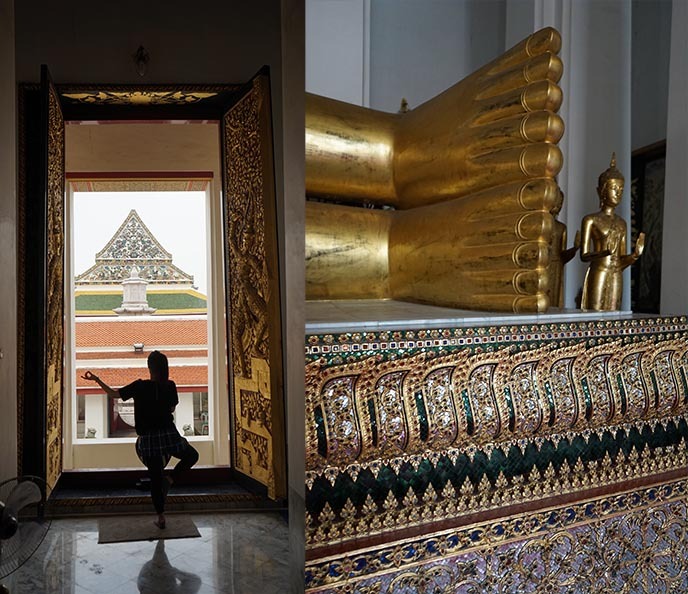 Don’t avoid these sacred sites, simply because they’re popular — they’re among the most impressive ones in Thailand. 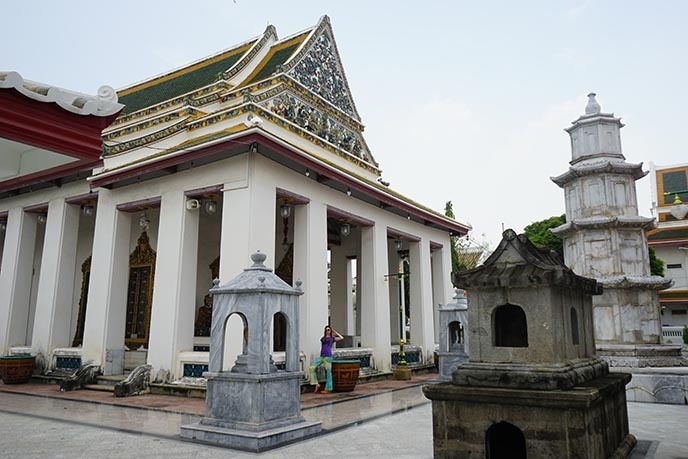 We struck a balance by visiting those two landmarks quickly, and then took our time to wander around two little-known temples on the outskirts of Bangkok. 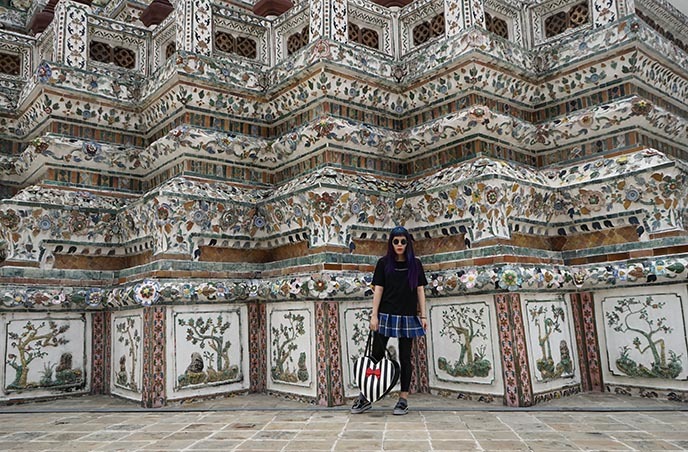 We’re at Wat Ratcha-Orasaram, a royal monastery built in the Ayutthaya period. 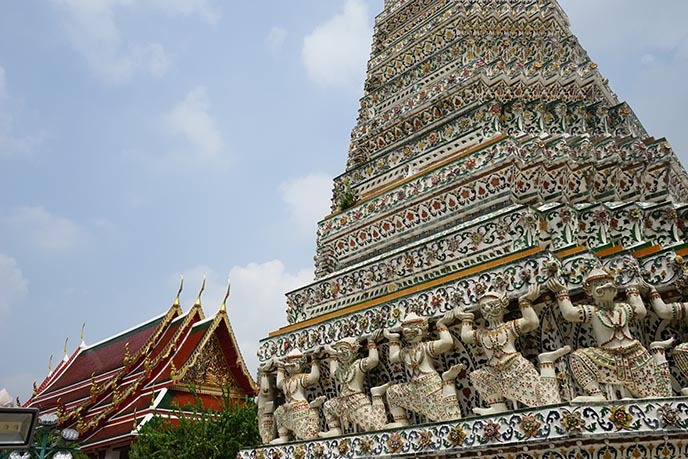 The prince was influenced by both Thai and Chinese art, hence the unusual temple colors and carvings. Can you spot Yukiro beneath the colored eaves and white pillars? You can see I’m not exaggerating when I said there was nobody else around during our visit. 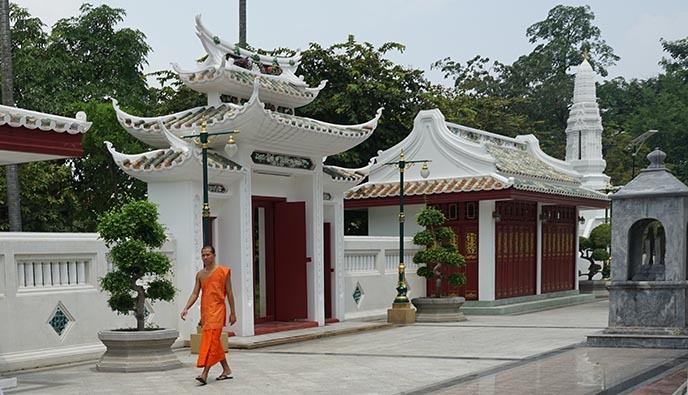 In bustling Bangkok, it was a joy to take our time to meander through this peaceful monastery. We said hello to the resident golden Buddha icon. 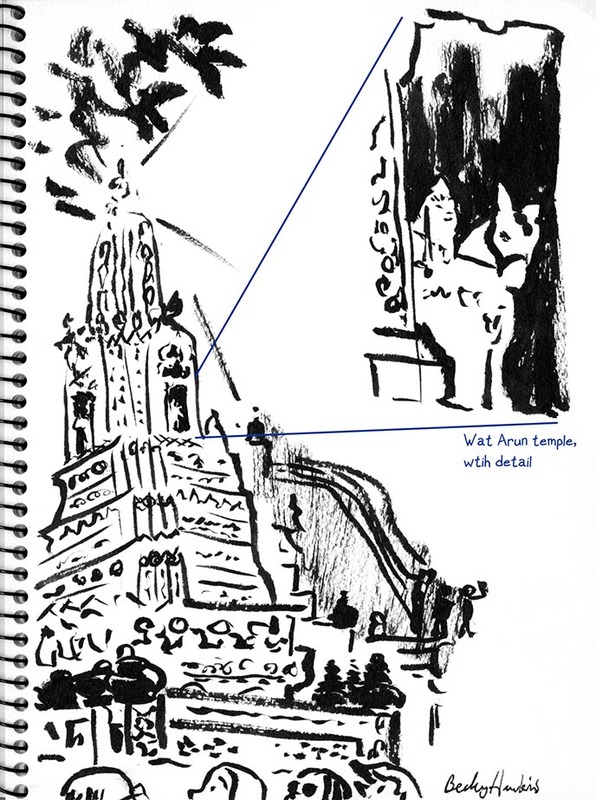 Becky Hawkins made this drawing that gives you a sense of the ornate detail of the altar. In this unhurried atmosphere, she and Naomi could take all the time they wanted to draw their surroundings. Yukiro and I mosied around and took photos of the fascinating details. 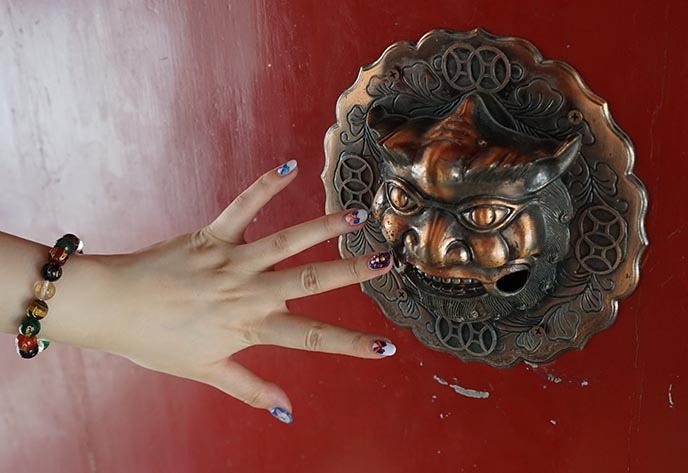 Of course we were drawn to the metallic demon on this red door, with a fierce grimace and horns. 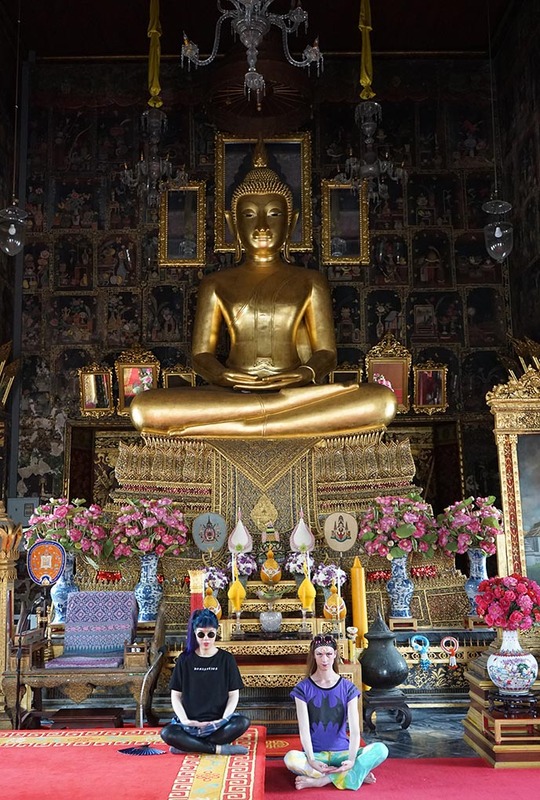 Love the elegant features of the Buddha, sitting in the lotus position. The chandeliers, candles and surrounding murals add to the radiant feeling of the room. 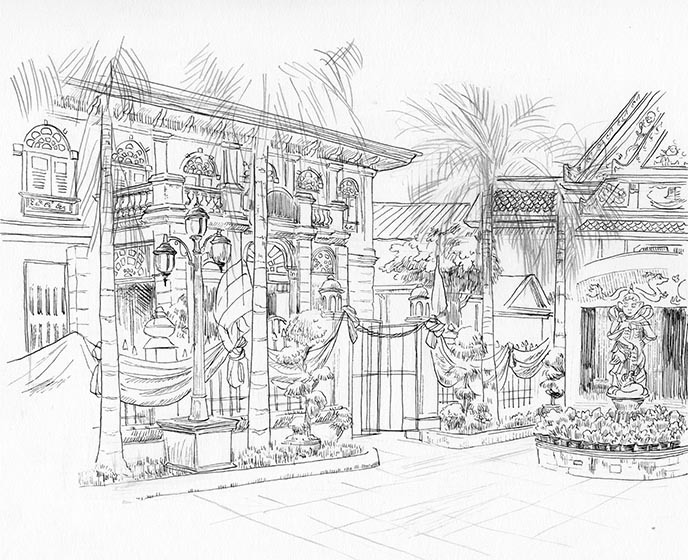 Naomi Rubin sketched the residence of the monks. It was surrounded by shrubbery that looked like it had been pruned by Edward Scissorhands! 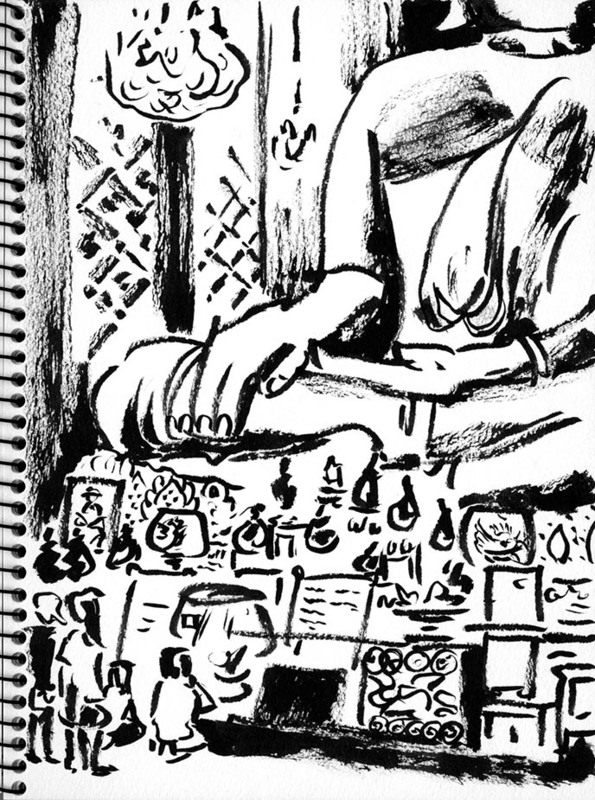 She has been posting these travel drawings as part of her web comic Moonsprout Station; you can read the Thailand dispatches here. We were glad to have our Tours by Locals guide Kay with us, as he introduced us to these secret spots and answered all our questions. 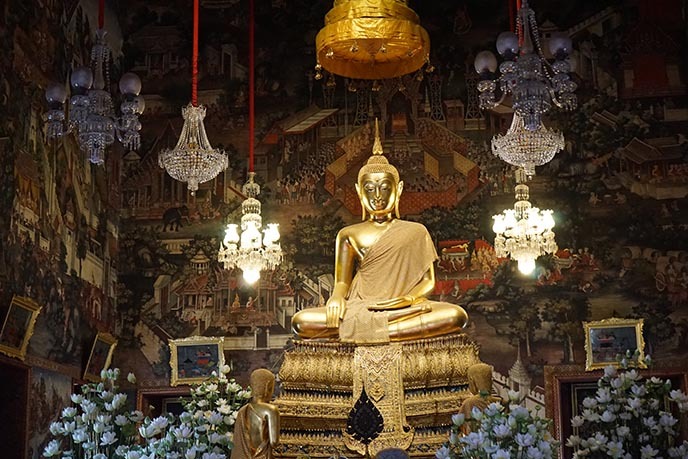 Whats’s the deal with the fan in front of the Buddha’s face? Is he being coy? Kay explained this traditional fan with a long handle was made of talipot palm leaves, and used to cover the face while chanting. 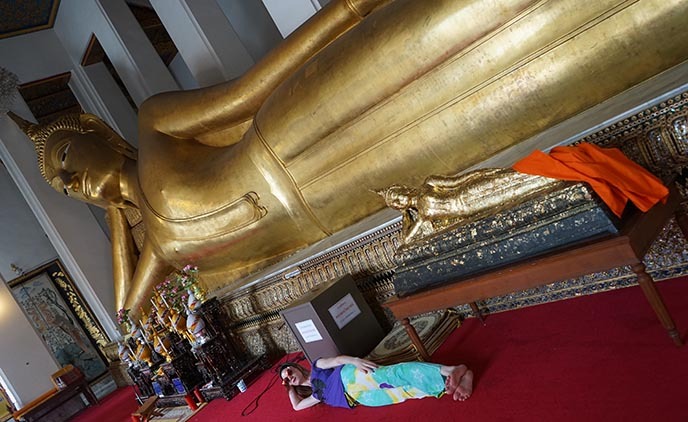 We dared not disturb the Buddha’s repose by ringing the giant bell. 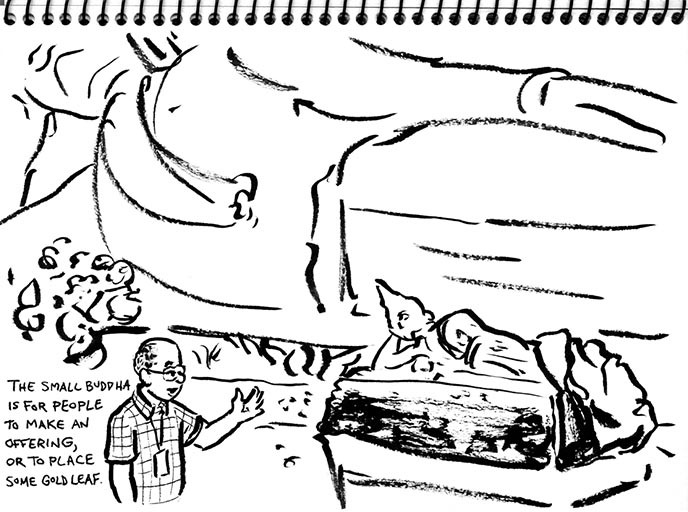 There was so much to see at Wat Ratcha-Orasaram, including sculptures of all sizes dedicated to the Buddha. 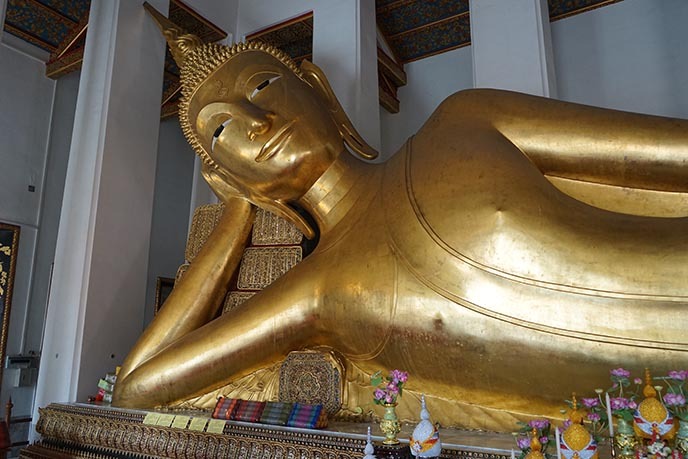 In the Ordination Hall, we came across this giant gold reclining Buddha. Love the chill expression in his eyes. Becky Hawkins captured Kay in action. We couldn’t have seen all these temples and learned so much without his guidance. Close-up on the Buddha’s extra large feet, with toes all lined up. Looks like Yukiro wants to join Siddhartha in hanging out! 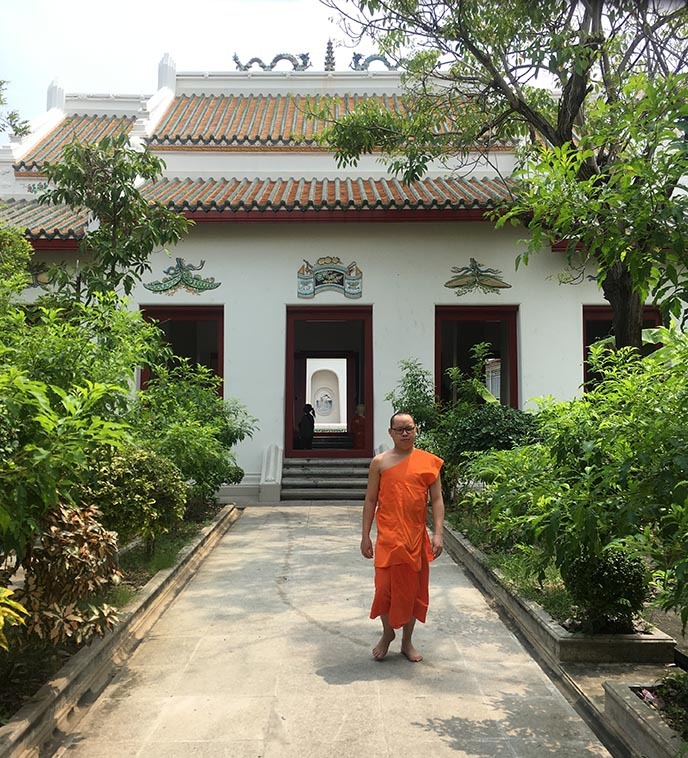 We saw a few monks walking through the courtyards, wearing their signature vermilion robes over one shoulder. 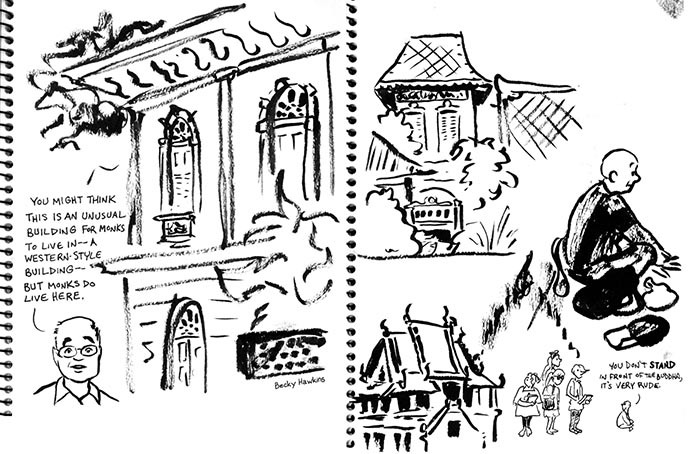 Becky Hawkins sketched these scenes from daily life in a Thai Buddhist monastery. Yukiro and I got some posing inspiration from these green yakshas. 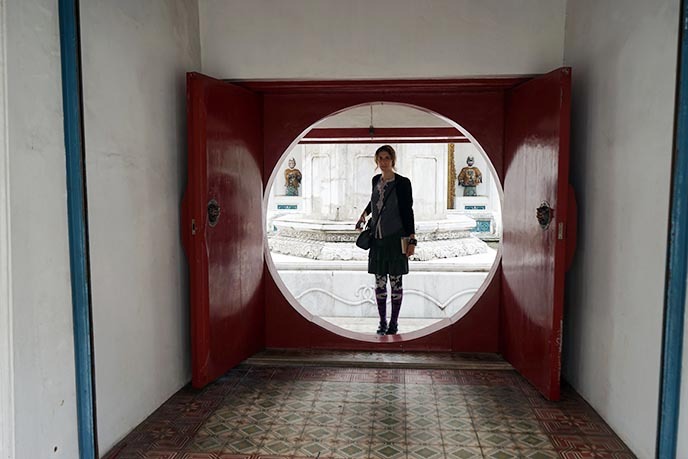 Seeing art and architecture like this, firsthand… this is why we live to travel. 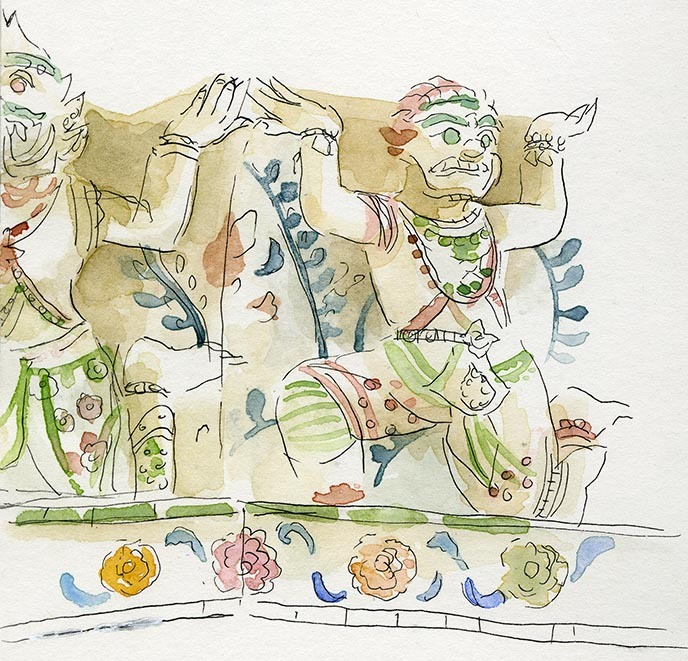 From the trees to the rooftop carvings, everything is richly yet subtly decorated. Many Buddhists come to a Wat Kalayanamitr for New Years blessings. 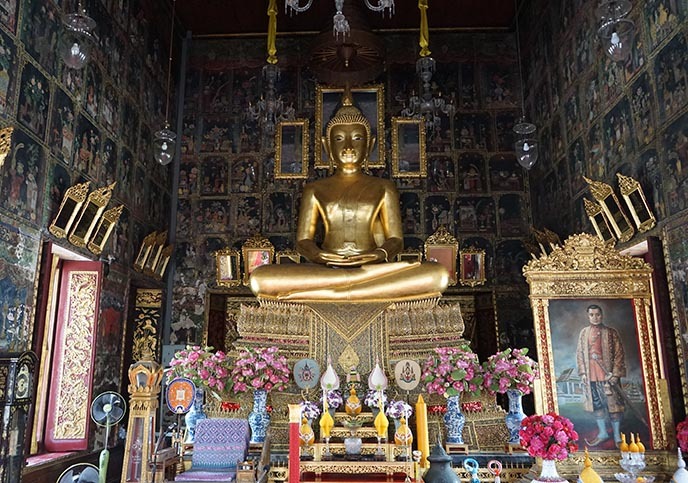 The gold Buddha statue has a slim frame and long earlobes, and is the only Thai temple to feature him in Palilai posture. Such fun to visit the “friendship” temple with friends I’ve known through thick and thin, for over 10 years now! The gold, red, and green details make the white structures stand out. This wat is also a monk’s residence. 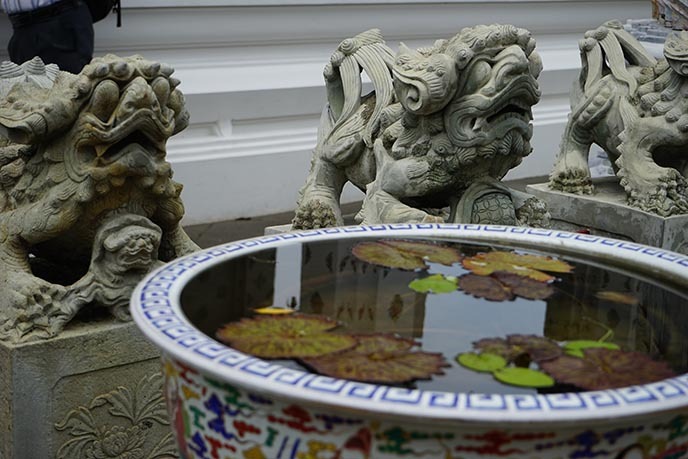 If you come across any visitors here, they’ll be locals performing spiritual rituals. 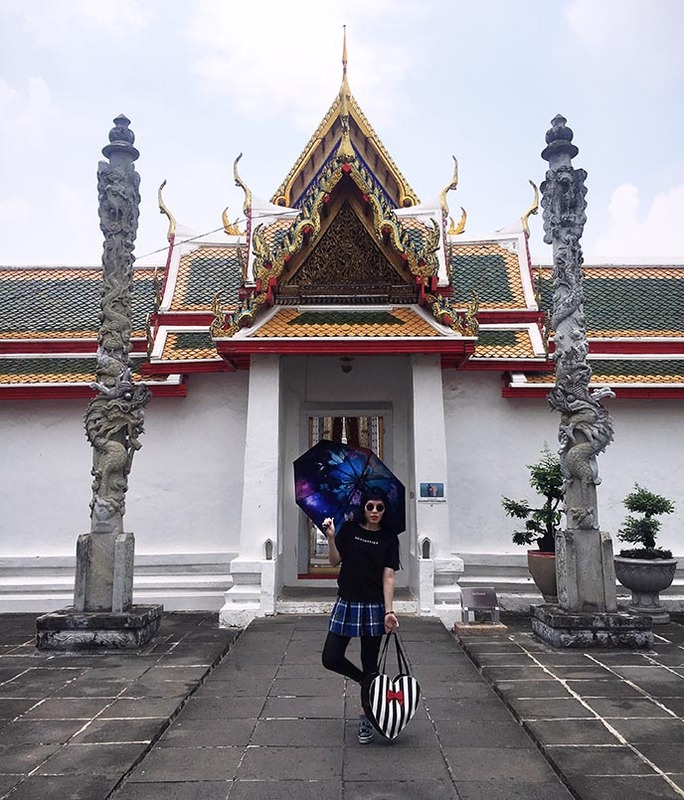 When visiting Thai temples, you should cover your shoulders and knees. 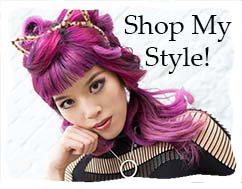 I’m wearing a short tartan skirt like the ones below (click to see). 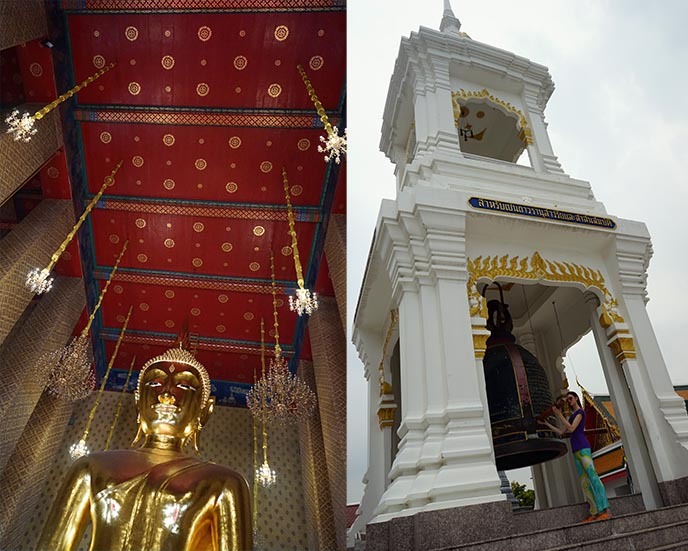 Grateful to Tours By Locals for letting us see this special side of Bangkok. We would never have heard of these monasteries if it weren’t for Kay. 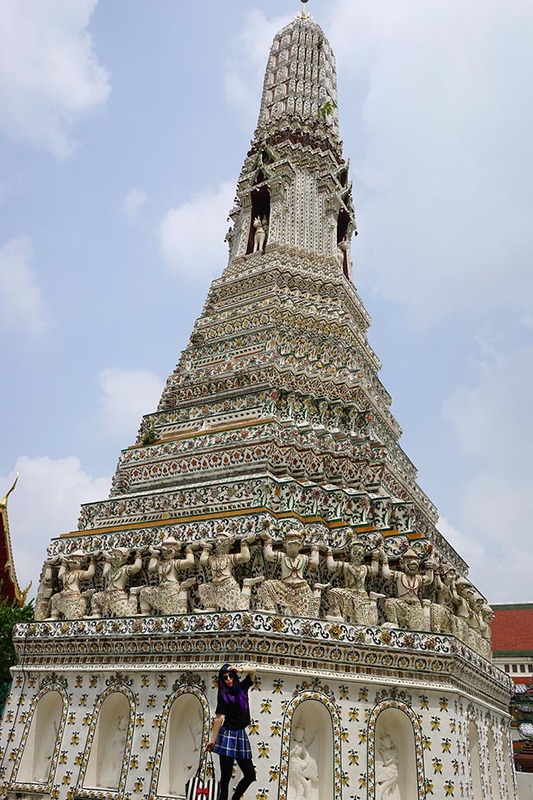 We’ll finish off at Wat Arun. Kay took us here in the early morning so that we could avoid the hoards of visitors. 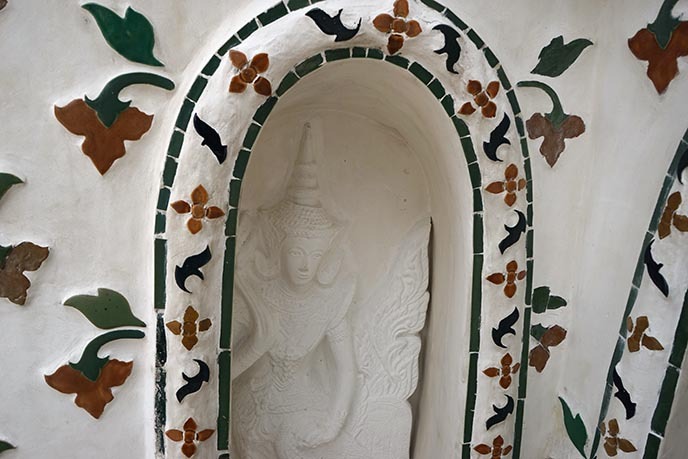 We were transfixed by this towering prang, or Khmer-style tower, studded with porcelain carvings. 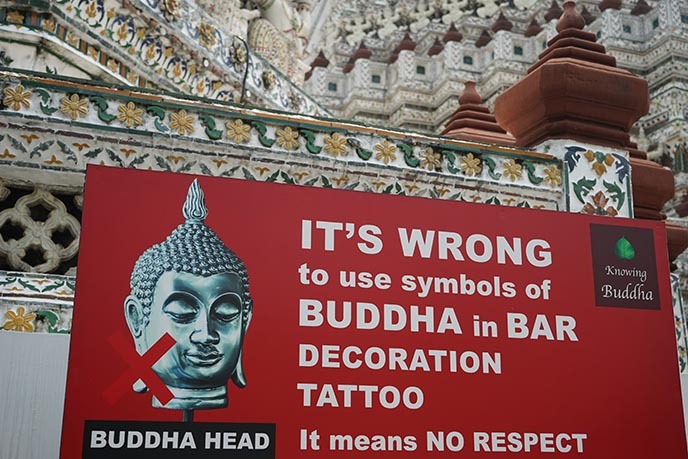 There were quite a few signs and billboards around Bangkok with this message: don’t use the image of the Buddha in tattoos, bar decor, and other ways they consider disrespectful. 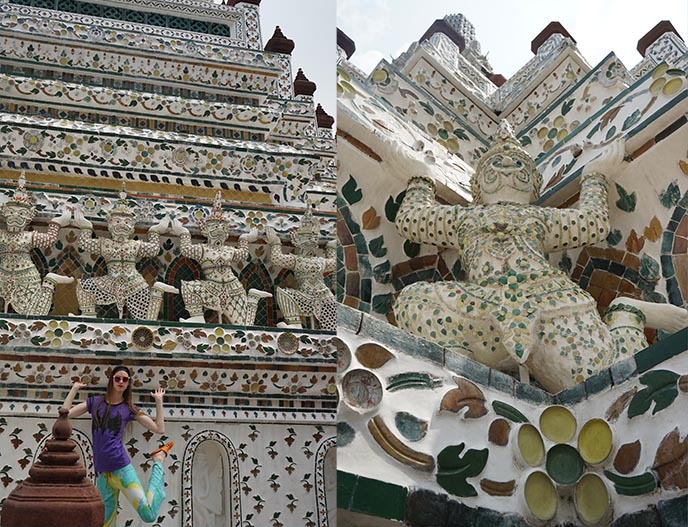 This huge central prang is covered in stucco figures from Hindu and Buddhist mythology. The various levels symbolize the realms of existence. These “Khon” figures have a heavy load on their shoulders, wouldn’t you say? 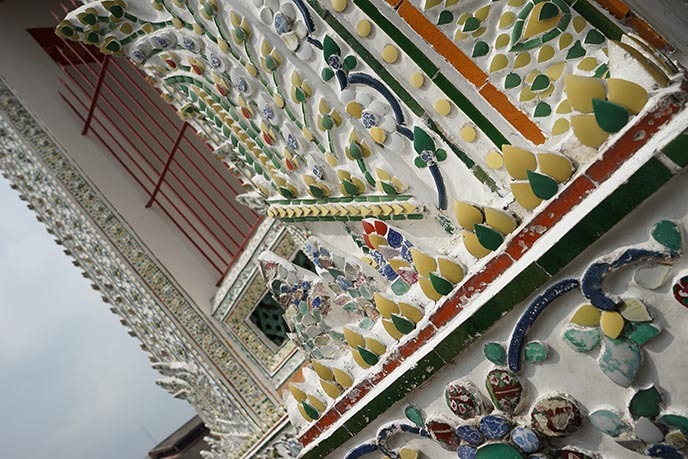 Close-up on the artistic details at Wat Arun. Some of the 3D elements are seashells. Ready for another Italo Disco refrain? Elegant goddesses peered out from these arches. 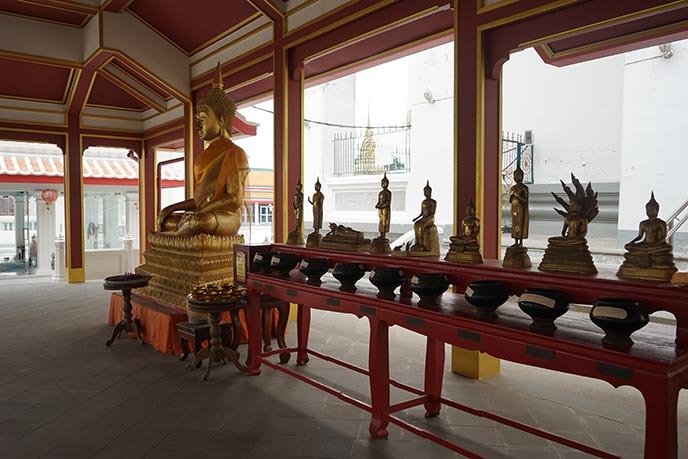 Also known as Wat Chaeng, this temple is dedicated to Aruna (Hindu God of Dawn). Located by the river, these spires sparkle at sunrise and sunset. Becky’s take on the grand pagoda. Love how she captured the horse sculpture detail. 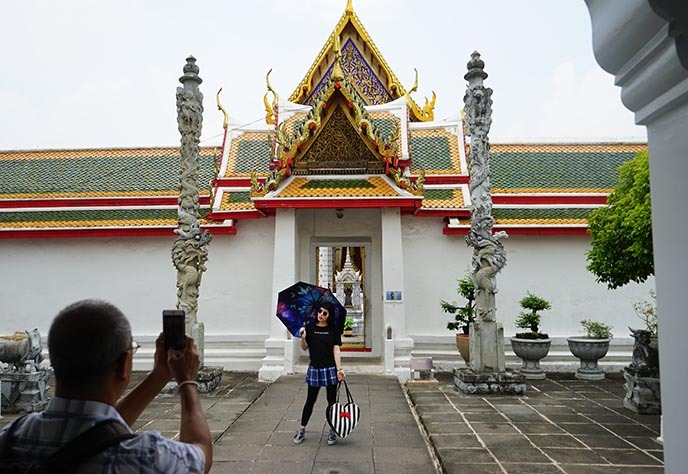 If you’re heading to Bangkok (or any major destination), give Tours By Locals a look. 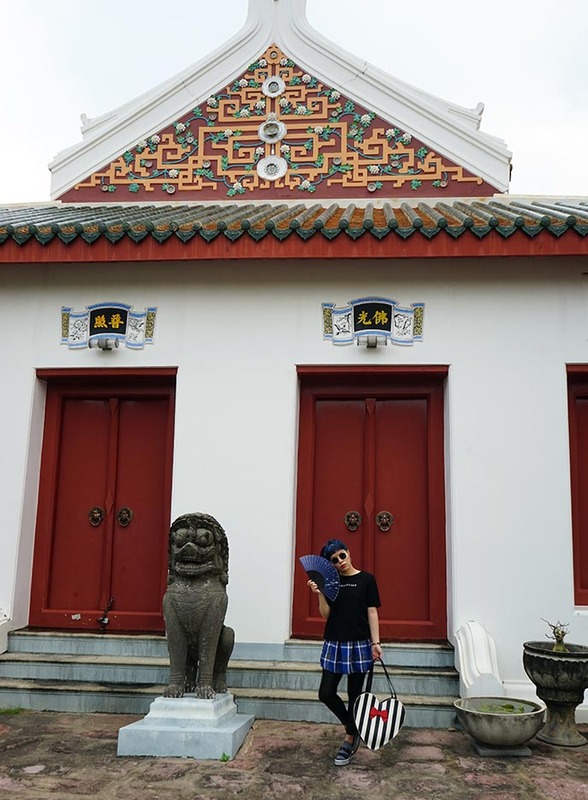 As you can see from our temple hop, they help you get the most out of your destination — with entirely bespoke private tours led by a fantastic guide. I teamed up with Tours by Locals in Luang Prabang, Laos as well: check out this travel diary of our waterfall trek.